This week a Downtown nightclub posted to Facebook that it will no longer be playing hard rap music. The club’s post said the music attracted a certain “urban” crowd and talked about “black on black crime” outside the venue. The post was later deleted. Okay. Let’s see what we have here. 1) Kudos for wanting to run a club where everyone feels safe, but 2) posting that during MLK50 week (or really, any week) is a textbook example of how not to do public relations for your business. Advice for any club in Memphis that wants to clean up its overall feeling of safety: Here’s what you need to do. Have a drug-sniffing dog at the door. The dog sniffs everyone, and I do mean everyone, who walks in. Patron fails the dog test: They’re refused admission. Employee fails the dog test: Fired on the spot and banned for life. Manager fails the dog test: Fired, banned, and detained until MPD can get there. If you want to make your venue crime-free, making people who prefer a certain style of music feel unwelcome is not the way to do it. Nor is making people of a certain skin color feel unwelcome. Make criminals feel unwelcome. It’s as simple as that. Weekend! The thing I’m looking forward to the most is the BBQ Fest cooks’ meeting tomorrow. You may have an image of a bunch of grillmasters standing around hearing the rules from Memphis in May representatives. That’s what I thought for a long time too, but that’s not what actually happens. It’s “give us all yo moneyz” day as we write checks for park entry wristbands for team members, 24-hour wristbands for cooks and those who stay late to clean up, electrical equipment and various other things. If you’re contracting with a Memphis in May-approved scaffolding vendor, you write a check for that. Even the folks who will bring IVs to your booth to cure hangovers are there accepting money. The meeting is at Old Dominick Distillery, which I still have not yet been to. Looking forward to venturing outside my PBR box for an Old Dominick cocktail. Just one, though, because later in the day tomorrow I have WrestleMania to watch. Tickets for the Memphis Flyer’s Bacon & Bourbon Fest are now on sale. The event will be under the Memphis Farmers Market pavilion Saturday, April 21 from 6 to 9 PM. Your ticket includes tastings of 15 bourbons, as well as sampling of pork dishes from some of our best local restaurants. General admission tickets are $41.61 including convenience fees. Proceeds benefit the Memphis Farmers Market. The Memphis Redbirds have a new Redbirds Rundown podcast you can listen to in order to keep up with the latest team news and happenings. ALSAC/St. Jude is asking the city to sell one of Downtown’s oldest fire stations. For seamless expansion of its campus, ALSAC is looking to purchase Fire Station No. 1 at 211 Jackson for $975,000. Check out the Redbirds’ group outing packages. The ‘birds have multiple options for groups of 20 of more, each of which includes a new Redbirds hat and a voucher for a Coke and a King Cotton hot dog for each guest. Packages must be purchased from a group sales representative. 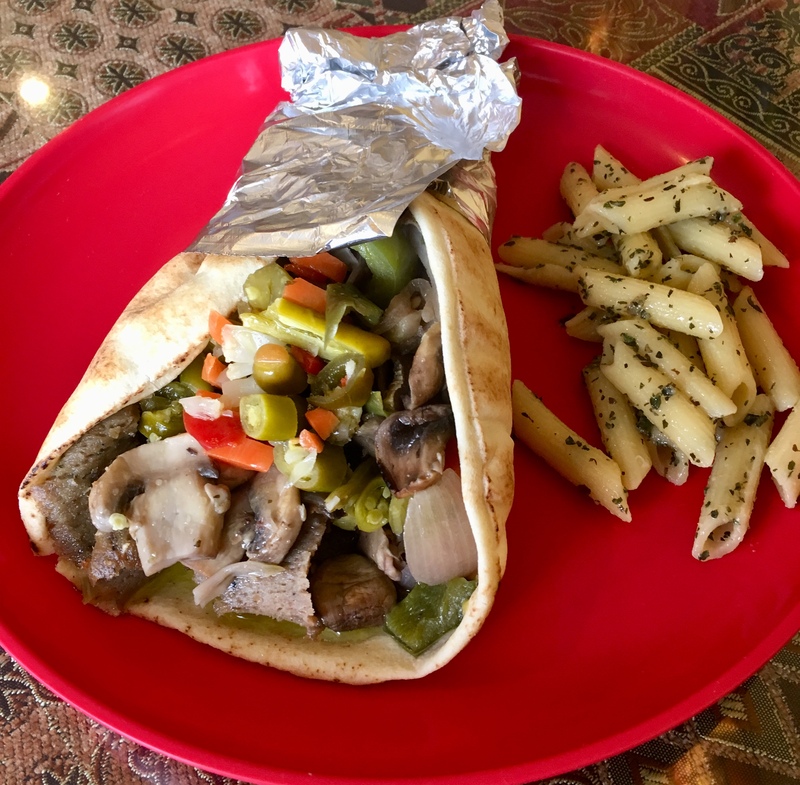 For my East Memphis/Germantown lunch yesterday I returned to Cafe Med on Kirby Parkway for their Spartan gyro, a gyro topped with sauteed mushrooms, onions, bell peppers, and hot giardiniera mix. It was very good and I was in and out of there in under 25 minutes. All right. Time for a meeting with my Deputy Director of Public Relations to plan for this cooks’ meeting tomorrow. Your work is never done when you’re on a BBQ team. Back tomorrow with more news.